do what i did! import one from another state! mine was an AZ car! I've been "cataloging" every 8er I've seen in Fresno, and so far I've found 9 different owners. I've had the pleasure of speaking to 4 of them, and Marv is definitely right... most of them are "business" people who have no idea about forums like these . 2 Silver 840Cis - Met 1/2 owners. 1 Black 840Ci - Drove around town with owners of this car (they just happened to be going where I was going). 1 Maroon 850i w/ CSi body kit. Met the owner. 1 Green 850i - This car is owned by the owner of Weber BMW, my local Stealership. 1 Black 850Ci - This car is for sale by original owner (so I'm told) asking $9995. The car is in beautiful condition from what I have seen, but I have not driven it or spoken to the owner. It's on Cedar and Herndon for anyone familiar with this area. 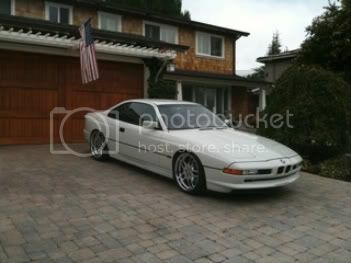 I saw a silver E31 with stock wheels on the corner of Stevens Creek and Saratoga in San Jose today around 11 a.m.
no problem! im surprised that it wasn't thought of before. hopefully, we can help jud out! Would it be fair to spot my own E31? Each time I park I really do an over the shoulder look back each time on my car. Boy does my car look great! Was driving to Key West on Saturday, saw an oxford green 850 heading north towards Miami. anyone here? I thought I had the only 8 in the Memphis area until I saw a silver one recently. It was headed East on I-40 near the Wolfchase Mall area. 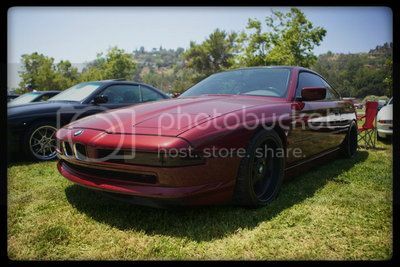 I saw a red one with Dinan listed on the left 3 days before I got mine (10 days ago) getting on 101N from Redwood City. I saw a green 850Ci in San Ramon yesterday - Waived to the elderly couple and they didn't want anything to do with me...was in my other car or they thought I was crazy. Didn't look "bad" but you could tell they don't know what they have or at least don't appreciate it...original 16" rims as well. Great to see another new owner from The Bay! If you see a silver 850 with E40 knocking/trying to get out of the trunk that would be me . Nice MBeezy! Was wondering where E40 went....last time I saw him he was playing roulette in Vegas (seriously)...far from Vallejo! I spotted it comming off the san mateo bridge around 4:00PM anyone from here ??? I'll pipe in here since I'm in The Bay ...saw a Black 850i driving East on Broadway Ave today in Burlingame, CA. Can't wait for someone to spot mine when I actually get it back from the shop after giving her some love ! Black 8 with tinted windows, stock turbine rims at the Mexican fast food restaurant at the corner of Central/Washington Blvd in Los Angeles around 6pm. Car was followed by another Bimmer...maybe a 5 series...was more focused on the 8. Drove off before I could say hi. Anybody here? Spotted a calypso red 8 near union square on Ellis St. In San Francisco around 4ish. Anyone from the board? Black 840 with stock 16's on Pico and Ave Of The Stars around 3-4pm today. And... For the umpteenth time, I saw the poor black 8 with a smashed up left side body panel on Sunset near San Vicente parked at a meter. I've seen this car in Hollywood driving around many times. La Brea and Highland, another black 8, this time an 850 with 18" chrome food processor wheels. I've seen this one a few times in the mid-city / hancock park area. This car is not to be confused with yet another black 840 with chrome wheels that is living in this same area (I see this gentleman often whizzing by me). I hardly report my sightings anymore 'cuz no one cares it seems... But I gotta say, there's lots of 8's cruising around LA in the last year or so. At least once a week I see an 8. I've never reported a spotted car that someone here has chimed in on. But I did bump into a forum member here once in person in Santa Monica. He wasn't drivin his 8 at the time but with my windows rolled up, I heard a "K o I z u m I !!!" being yelled out whilst at a red light! Now that was dope! A forum member recognizing my car just like that, randomly, while at a red light ! I havnt seen this gent here on the 8 forum in a while... Hope you're good Cel! Last edited by Koizumi; 12-24-2009 at 12:11 AM. i love hearing stories of when people spot 8ers! even better when you're recognized by someone! Saw a black 8-series in San Jose turning onto Fruitdale from Leigh on Christmas Eve around 2 p.m.
Montgomery, Tx - white '91 or '92 850 in a WalMart parking lot (Walden Rd & Hwy 105) - knocked on drivers side window - I think she thought I was gonna car-jack her. Saw same car parked outside a dry cleaning shop, same area, the woman working behind the counter (owner?) was the same as above. I saw Alec Cartio's Dakar Yellow 840ci a few days ago on Winchester Blvd in Los Gatos, CA. i've been to that place many of times... but never seen this in one of the museums as one of the exhibits!